Tucked away in the Armour Yards development right off of Piedmont Road lies a diamond-in-the-rough coffee shop with posh decor and plenty of in-house roasted coffee. 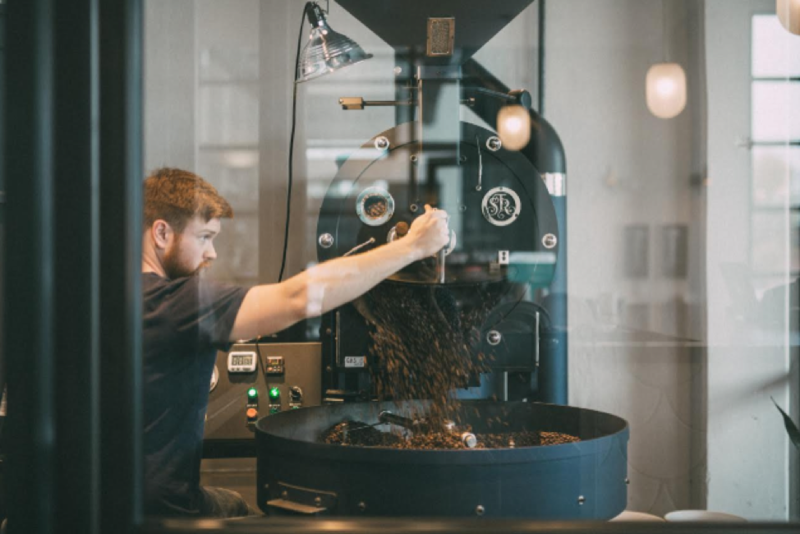 East Pole Coffee Co., an Atlanta-based specialty coffee roaster, wholesaler, and coffee bar, sets the bar pretty high for the local coffee scene. Started by spouse duo Sara and Jared Karr along with Jules Tompkins and Matt Chesla, East Pole is a nautical-themed coffee spot that opens its doors to all who wish to try its offerings. Jared Karr took The Creative Folks behind the scenes to delve deeper into the brand’s mission and day-to-day routine. When stepping into East Pole, one can see the service counter and seating area followed by smelling the wonderful pick-me-up aromas of freshly-brewed coffee. But behind all of that lies a shiny black and silver contraption that looks like it was pulled straight out of a locomotive. Photo courtesy of East Pole Coffee Co. The machine behind the glass panels, Karr clarified, is a coffee roaster that is used to craft the brand’s unique roasts. Karr then went in-depth about East Pole’s roasting process. As Karr explained, the roasting process takes a bit of both art and science and involves lots of chemistry. Essentially, once the green coffee beans are loaded into the roaster, they are heated until they “crack.” The cracks indicate the temperature of the beans during the roasting process and help determine when the beans are roasted enough to then be cooled and eventually brewed or packaged for wholesale. Karr explained that he aims for a sweet spot between the first and second crack depending on what type of roast he plans on making. Coffee beans that are roasted closer to the first crack tend to make lighter roasts than coffee beans that are roasted closer to, or even after, the second crack. When we sat down and got the chance to drink the coffee, I was genuinely surprised at how delicious it was. It was clear that East Pole’s brew was smooth and perfectly balanced. Karr also explained that while East Pole has a storefront location for patrons to dine at, a big focus of the company is wholesale. The company launched a new subscription program where coffee fans can sign up to receive packages of a variety of the company’s roasts weekly, bi-weekly, or monthly. The Human Resources subscription allows small businesses, larger organizations and corporate folk alike to get their coffee every week starting at $35 per week while the Scuba Club and Yacht Club subscriptions allow individuals to get monthly and biweekly coffee packages starting at $20 per order. While amidst many industrial sites, Karr appreciates the area’s food and beverage neighbors, including SweetWater Brewing Company, Fox Bros. Bar-B-Q’s “Que”-osk, ASW Distillery, and Los Amigos Tortilla Manufacturing. “Our location is a very weird location, and, honestly, we’re very okay with this location because our business is wholesale,” said Karr. Overall, East Pole may sit quietly tucked away in a very nestled part of the city, but it sure packs a punch with its feel-good atmosphere and in-house roasted coffee. After seeing the dynamics of the place and learning more about the care that goes into each cup of coffee, it’s easy to see how much East Pole care about its products. Justin Clay is an Atlanta native with an enthusiasm for storytelling. When he is not wandering through Buford Highway for delicious eats, he is most likely delving deep into his horoscope or finally making it to a yoga class. His bylines appear in Creative Loafing, JEZEBEL, MTV Founders and a few others.